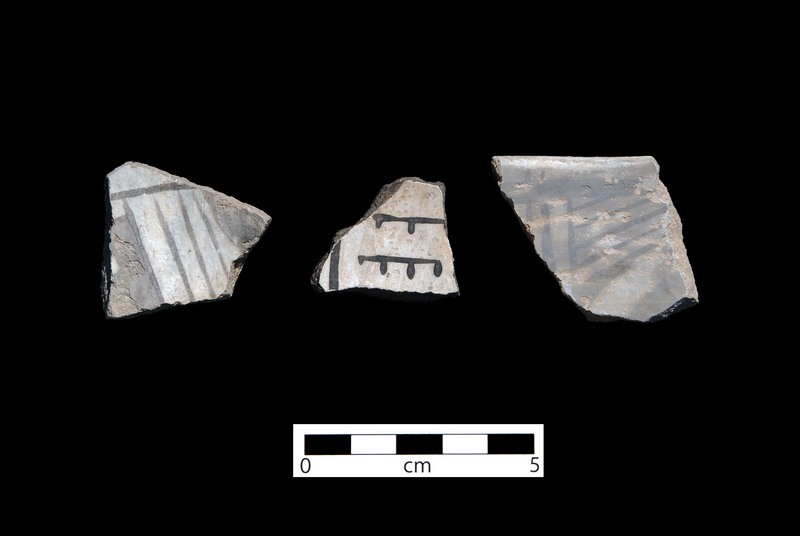 St Joseph Black-on-white sherds. Click the image to open the St Joseph Black-on-white gallery. St Joseph Black-on-white is a Little Colorado White Ware type found in the Petrified Forest, Arizona, and surrounding territory. Date Range: A.D. 825-1025 (per Christian Downum, Northern Arizona University). Temper: Crushed sherd (appears as abundant white, gray or tan angular fragments); quartz and volcanic rock fragments, especially augite are common. Surface Finish: Thick, chalky, white to light gray slip; moderately polished. Forms: Bowls, seed jars; possibly other jar forms. Vessel Thickness: 5.2 to 6 mm. Paint: Organic paint, light gray to rich black; soaks into the slip. Design: Consists of Kana-a style thin lines and solid triangles. Grouped parallel thin lines are common, often overlapping at junctures. Triangles sometimes have ticked edges. Comparisons: Kana-a Black-on-white has light paste, sand temper, and thinner slip (if any). Kiatuthlanna Black-on-white, Puerco Valley Variety has mineral paint. Other Names: Dead River Black-on-white.